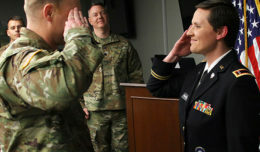 Tawanna Clapp, an Army Military Spouse stationed with her husband at Fort Huachuca, is actively seeking a kidney donor to help save her life. Looking at Tawanna Clapp you wouldn’t guess that she spends 21 hours a week on dialysis. Tawanna was diagnosed with focal glomerulosclerosis, FSGS, in 1996 during a routine physical for college. According to the National Kidney Foundation, FSGS is a disease that “describes scarring in the kidney. After being diagnosed, doctors gave Tawanna a life expectancy, “I knew eventually a transplant would come, but at that time though I actually had a life expectancy because they didn’t know much about it, it was still a relatively new disease,” she said. Fast-forward nineteen years and she is now happily married to Staff Sgt. LaRon Clapp, Fort Huachuca Select Honor Guard, and helping raise daughter LeAera, 12, while teaching as a Title One teacher at Berean Academy. 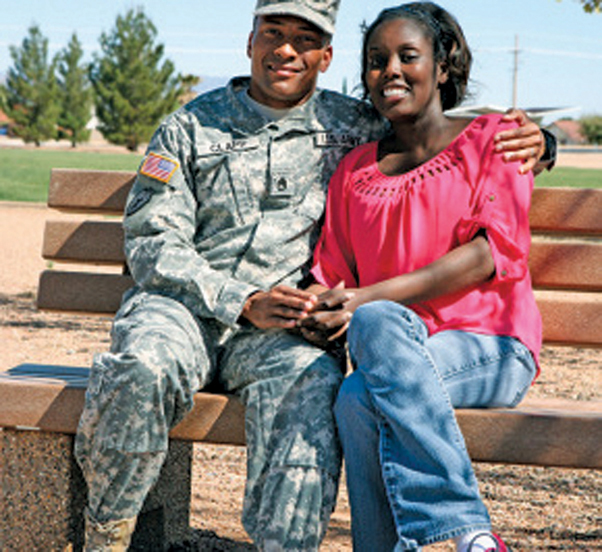 The couple has been stationed at Fort Huachuca for the last three years. Life overall seems pretty normal for the family, except the couple are now actively searching for a live kidney donor. “When I got here my nephrologist tried a lot of different things to try and slow it down,” Tawanna said. “In 2013 she had put me on prednisone to help, so I gained a lot of weight and then she stopped because it wasn’t really working anymore.” Tawanna tried everything to shed the weight but was unable to. “At the same time, I was drinking water but wasn’t going to the bathroom as much, and my ankles started swelling so there were all these signs that my kidneys had failed. I had no clue, I had never put them together until February 2014,” Tawanna said. In February 2014 Tawanna was admitted to the hospital for what doctors initially thought was pneumonia. After running tests it came to light that her kidneys were functioning at just five percent. With both kidneys failing, she was placed on emergency dialysis. Tawanna is now on peritoneal dialysis, where she has a catheter in her stomach and she can attach a bag of dialysis solution to one tube and drain from the other. The process takes about 45 minutes, four times a day every day. “I am able to do it at home. I have an extended lunch break from work. After I’m finished I just attach the cap back on and tape it down or wear a maternity belly band and go on about my business,” she said. “Sometimes it gets old, I get tired of having to come home, and I can’t just sit, I have to sit down and do this then dinner needs to be cooked, children need help with homework, you kind of don’t even have a minute because it’s this extra thing, but I just have to balance it,” she added. “It’s either this or you can be dead, which one do you want so that’s the one thing. I just have to remember, it’s my new normal and then after the transplant I’ll have another new normal,” Tawanna said. After the transplant Tawanna will no longer have to be on dialysis but will be on medication for the rest of her life. She currently takes about five different medications to help assist her body to make up for what her kidneys are no longer able to do. “I’m just ready to get it over with,” she says with a laugh. Through this whole process the couple has held a sunny demeanor trying to find humor in the situation. Tawanna has A positive blood that means her donor must have the blood type of either A positive or A negative or O positive or negative. LaRon happily offered up his kidney, but he is not a match either. “I’ll donate my kidney in a heartbeat, if the Army clears it. Someone take my kidney. Someone take this and give me yours now,” he excitedly yelled. “If I could give it and still serve that would be fantastic, and I would do it in a heartbeat, but we’ll see what they say,” he said of wanting to donate to someone else in need. LaRon is currently researching the Army’s policy on kidney donation and service after the procedure. 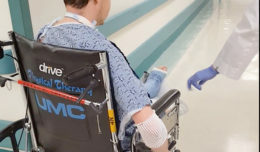 After the news of her kidney’s failing the couple researched different hospitals and finally decided on Mayo Clinic in Phoenix for the procedure. Along with being placed on the donor list for a deceased donor’s kidney, the clinic has also told the couple they can begin actively searching for a live donor. There is no time frame given by the clinic, but it tells patients they will receive a transplant within three to five years. “My insurance covers it all. They won’t even contact the donor’s insurance company actually,” she said. “And we are talking about starting a gofundme site to take care of little expenses, for the donor to not have to pay for lodging,” LaRon added. Tawanna has to go to Phoenix for the procedure and her follow-ups but the donor can donate in Florida, Arizona or Minnesota. The donor could also do their six-month, one- and two-year check ups at any of the locations as well. “All the donor has to have is compatible blood type either A or O and be healthy, no excessive drinking, smoking, drug use, but they will do a survey on them, also no other major health issues, that’s why they do the big medical screening. They check you top to bottom so it’s kind of good for that person anyway, might have something they never knew about,” LaRon said of the qualifying factors. “It’s best case – worst case. Worst case, she dies; best case, everything goes fine and she gets a new kidney and lives a healthy life and lives a happy life. I think it’s healthy to look at it with best case – worst case. Honest answer [is] she’ll probably end up some where in the middle,” he said. Qualifications for a living donor at the Mayo Clinic are: 18 years or older, blood type compatible, no major medical problems, no active or chronic infections, no active drug or alcohol abuse, acceptable height and body weight ratio and compatible donor anatomy, as listed on the Mayo Clinic living donor kidney transplant program brochure for potential living kidney donors. The screening process, which initially can be done over the phone, will help answer these questions for a potential donor. If interested in donating contact the living kidney donor team at the Mayo Clinic Transplant Center at 480.342.1010 or SDLKidney@mayo.edu.